MT uses magnetic fields and small magnetic particles, such as iron filings to detect flaws in components. Liquid Penetrant Testing is used to test a variety of both metallic and non-metallic materials such as welds, forgings, castings, plastics and ceramics etc. It is the most effective method for economically revealing surface discontinuities in a variety of dissimilar materials. Radiographic Testing (RT) involves the use of penetrating X or Gamma radiation to examine parts and products for imperfections. 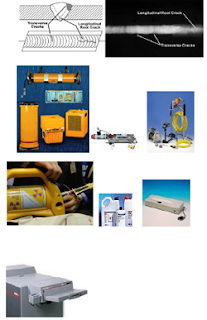 An X-Ray Machine or Radioactive Isotope is used as a source of radiation. Radiation is directed through a part and onto a film. When the film is developed, a Shadow image is obtained that shows the internal soundness of the examined area. Possible imperfections show up as density changes in the film, in much the same manner as an X-ray can show broken bones. Ultrasonic Testing uses sound waves of short wavelength and high frequency sound energy to detect flaws or measure material thickness. Such mechanical waves can travel large distances in fine grain metal, in the form of a divergent wave with progressive attenuation.